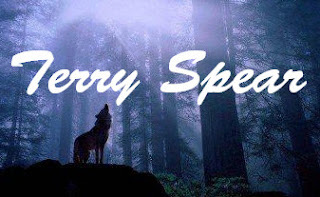 Terry Spear is one of my favourite paranormal romance writers and a frequent guest (yes I play favourites). Her werewolf series always entertains and pleases and Wolf Fever, the sixth book in the series was just released at the beginning of this month. Each book is a standalone and doesn't require you to have read previous volumes in the series. The series style is a perfect curl-up-on-the-couch paranormal romance and a mystery thriller. If you would like to win a signed copy of Wolf Fever or if you prefer, an earlier book from the series, just leave a comment or question for Terry and fill out the form at the end of the post. The giveaway is open to US and Canada residents until Midnight EST, December 23rd. Terry's post today is about the writing process and how Wolf Fever originated. So on with the fun stuff. Welcome Terry ! If You Have to Have the Fever This Holiday Season, Make It WOLF FEVER! First, thanks to Doug for having me here today! It’s always a pleasure to be invited back! And in the spirit of the holidays, it’s time for a giveaway! Wolf Fever is the 6th book in the werewolf series to hit the book stores and for those who are following the stories, like the others, it’s a stand alone title. But it’s more directly linked to Destiny of the Wolf (book 2) than other books have been so far. That’s because the characters in this book are the same ones, for the most part, that were in Silver Town, Colorado in Destiny of the Wolf. And it’s because I had multiple requests from fans to see more of what became of Carol. I love it when readers find a character so interesting, a happily ever after must be found for him or her, too. Like in each of my stories, I don’t plan who all will be in them and everything that they will do in the book. I started out with Lelandi wanting to solve the mystery of her sister’s death. And when she was at a historical celebration, I had a human woman wanting to make friends with her, while Lelandi’s wary. But Carol had a darker purpose in making friends with Lelandi. She had a warning to impart, knowing it was too late for her own salvation, but she wanted to save Lelandi. Many readers loved her because she was flawed and good hearted, yet determined to do what was right, but failing in some cases, which made her all the more human. In Wolf Fever, Carol has a chance to become one with her wolf nature, while truly becoming part of the pack. When writing a story, we can go in so many different directions. She accepts what she has become. She rebels against it. She partially accepts being a werewolf. But then we have to go into deeper motivation for the character reacting the way they do. Since she is already psychic, she doesn’t have full control over what she sees, and now with the werewolf business, she is fighting to maintain control over her physical side, too. Which in part is the reason she is so adamant about not wanting to shapeshift. But again, there’s a deeper reason, too. In all of the stories up until now, the newly turned werewolves have come to embrace that side of themselves, or are already werewolves and happy to be so. So this is the first time to deal with a stubborn werewolf who refuses to shift! But that isn’t enough to base a story on, so with all my stories they must have: romance, adventure, mystery, and conflict. Now, about the time I was writing this when it was really cold last year, the World Health Organization was putting out the word that we could have a flu epidemic. And I got to thinking about that. How could it affect werewolves? One of the exciting things about having the upcoming release of a book is receiving notification that the cover art is done. It’s always fun to send photos of the area and season that the story takes place and see what the art department does with it. The resulting covers are always great! So when I received an email from the art director that they wished to get into contact with the photographers on some of the photos I sent of summer in Breckinridge, Colorado, the location for Dreaming of the Wolf, I was ecstatic! They are working on the cover for Book 8! It’s amazing how real it feels that the book really will be out when a cover is done. Just like trying to keep the stories different so readers don’t feel they are reading the same worn out old story with just different characters, so must the covers be done so that they don’t look like all the rest and confuse readers. When they asked for my opinion on the cover for Dreaming of the Wolf, I thought that a field of flowers in the foreground of the Rockies would be the way to go because it’s summer and Jake’s hobby is to take pictures of wildflowers in the region. Dreaming of the Wolf is also based on the pack from Destiny of the Wolf. But in between Wolf Fever and Dreaming of the Wolf, readers will get to see the Highland werewolves in action in Heart of the Highland Wolf coming Jun 2011. Talk about a riveting cover! So whether you’re just getting started on the series, or have read all the books, everyone could use a little wolf in their lives! And here’s your chance to comment and win a free copy of any of the books I have on hand. Anyone ever see the movie, LadyHawke, about the heroine who is a hawk during the day, and the hero is a wolf by night? Only in my stories, the wolf gets his mate—romance dictates having a happily-ever-after! Thanks again, Doug, for having me! Wishing everyone a safe and fun-filled holiday! Terry--you are one of my favorite authors--love your wolves! I wish you a great new year of continued success! Doug--I'm so glad you came back to blogland! I wish you much health and happiness! Wow, 6 books in a wolf series, that I didn't know about? Thanks, Virginia, and Pam!!! Yesterday was so busy, I never even had a chance to drop by. Thanks so much, Doug, for having me again! I'll be at work again today, but will check in later! Looking forward to some day giving this series a shot, Terry. They look really interesting. Congrats on a great new book cover, too. I won Wolf Fever on a different blog contest and it came in the mail the other day. Great post. Wishing you the best in your writing, Terry! Can't wait to read Wolf Fever. It's really hectic now but the holidays will be over soon and I know just the thing to get over the stress of the holidays. Great interview, Terry! I love, love, loved Lady Hawke, so any book identifying with that storyline has got to be Awesome! P.S. I LOVE the movie Ladyhawke!! I have it in DVD and watch it frequently. Lynne, thanks so much! I'm thrilled you're enjoying it. This one is based on the pack from Destiny of the Wolf, Book 2, and Jake will have his story in Book 8. :) Thanks again! Another great book and great post. And I so loved LadyHawke. All time Favorite. Geez, I never thought of it before. That's when my obsession with wolves started and then you came along and fed my obsession. Thank You for Feeding Me. PS. Matthew Broderick is the so not hero type. But he's been in some of my favorite and most enjoyable movies. Hi, Virginia, and thanks! Hmm, I wonder if it's too late to get that movie for Christmas!!! Kyrrah, I'm thrilled you're loving Heart of the Wolf! It was in it's 3rd printing and is now in the warehouse again. But it's taken forever! So I'm hoping it'll be back out soon in stores! :) Thanks for being so patient!!! Enjoy! And your mention of having LadyHawke on DVD makes me want to get it too! Thanks, Donna! I'm delighted I can feed your wolf obsession! :) Matthew Broderick, yes, I agree! The Wizard of Oz series was my first reading love. Later I dove into Heinlein and Herbert. Then segued into fantasy. Your Wolf series is the BEST! I love your new Heart of a Highland Wolf cover! Wow!!! Hope Wolf Fever is a huge success for you!!! Ana, I loved Wizard of Oz also and read the whole series to the kids! My son is a big fantasy reader now. Thanks for loving the series! Thanks, so much, Lisa. I so love Heart of the Highland's Wolf cover too!!! It's frameable!! Terry, I have ladyhawke since I first saw it in the movie theater. have it on DVD, too. Hey there Terri! Looks like I'm going to start getting into shifter stories. Yours sound like a great place to start. They sound so interesting. By the way, I'm a Lady Hawk fan too! Woohoo, Shawn, good deal! Shifters have the best of both worlds! I'm looking into ordering LadyHawke now. Hope to get it before Christmas! :) Thanks again! 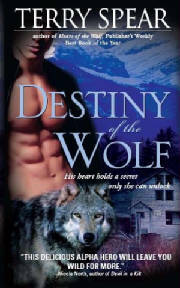 Jayne's Girl, Good, then you will have Wolf Fever to tide you over until Heart of the Highland Wolf comes out! :) And hopefully you're reading the free read also, Allure of the Wolf to help out there also. :)LOL! Thanks for letting us in on your writing process. I like how your books are connected yet written as stand alones, don't ever stop doing that. Love the cover of the Highland book. Can't wait! I'm so glad you mentioned this site. I had no idea it existed. Since I write futuristic YA, I'm having freat fun exploring everything. Always look forward to your books. Now that I know you are aware of Texas, I'm in Abilene, I'm even more excited about your time travel. Thank you for keeping so many of us entertained with your books. Ah, Kate, thanks so much! I like books like that myself, where they're stand alone, because I'll get into the middle of a "series" and not even realize it and be perfectly happy. But sometimes I'll pick up one where it's obvious I have to read the books in order, and I don't have the books that I can read in order! So I really try to make them stand alone titles! Thanks again, Kate! I'm so thrilled that you are enjoying my books and that you now know about Doug's site, Constance. He's the greatest! :) Abilene, another wonderfully old Texas town, would be perfect for a time travel too, don't you think??? :) Good luck with your futuristic YA! Absolutely, Sarah!! Hope you love them! 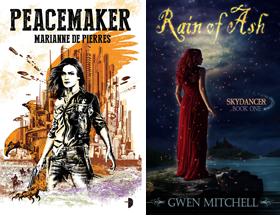 It's cool to find out what inspires authors. Lady Hawke was one of my favorite movies and you're a fav author of mine--I can't wait to see how the story evolves. I bet it'll be awesome. Thanks so much, Corrine! Hope you love it! I just read "Heart of the Wolf" and want to read some other books by this author. Thanks so much, Mary! Merry Christmas! Congrats on your success Terry! The series sounds fantastic. I'm behind on my TBR list but you've been on it for awhile. Would love to read it! Thanks so much, Cate!!! Hope you get a chance to read it! I'm reading time travels right now, when I get the chance!